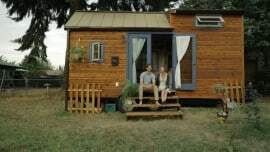 Film Review: "Small is Beautiful: A Tiny House Documentary"
My partner, Anjali, and I recently had the honor of pre-screening the much-anticipated Small is Beautiful: A Tiny House Documentary by Jeremy Beasley. I loved it so much that I HAD to write a review and share this all with you! First off, if you haven’t see the trailer yet, take a peek below. After seeing the film myself, I can say with certainty that it’s the best tiny house documentary to date! It’s beautifully filmed and edited, but that’s not what makes it special. What got me is that the characters are REAL, their stories varied, full of joy, hardship, and humanity! What I love is that this film doesn’t glorify tiny house living in ways some others might be tempted to do. Many of the characters struggle, and we get to see them falter and fail, sometimes to the brink of collapse. We see them question their motives, their partners, their relationships with their family and their past. What this doc really represents can be summed up very well by the final line of the film. I won’t spoil it for you, by the idea is that tiny house construction and tiny living is not easy. It can’t be done alone. Building a tiny house WILL test and exhaust you. Some may fail. But the process changes you, makes you examine you past, your goals and your dream of a better future. It prepares you for a new life of simplicity, of service, education, gratitude and joy! So many themes in this film I found paralleled my life and our experience as a couple living in a tiny house. It made me feel better about my own situation knowing that others are going through the same joy and pain that we did (and still do). As a larger community we are all that much stronger for our common struggles and for the knowledge that we are not alone in dealing with them. There’s so much beauty in the simple message of community and support, even though each character’s stories are varied, and the motivations for going tiny are different. Want to know what tiny living is really like? This is it. Right here. My advice: pre-order the film now. You’ll get it in digital format that’s yours to keep forever. Meet these real-life tiny house dwellers and more! I was struck by the honesty, the authenticity, and the vulnerability of this documentary. I wanted to yell, “Yes! They are echoing my personal experience…without sugar coating the realities of tiny house living!” I have to say that I felt validating when I heard the phrases: If we had to do it over, we would build “his and hers tiny houses with a bridge in the middle,” and building a tiny house will likely drive you to the, “brink of insanity.” I am in complete agreement. Building and living in a tiny house will not solve all of your problems, as many people seem to believe. It is a physically, emotionally, psychically, and spiritually challenging undertaking, yet offers tremendous opportunity for growth (as do all challenging experiences, right?). 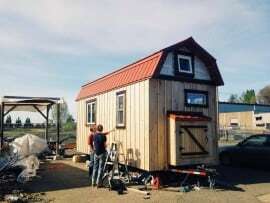 I also found myself feeling inspired to see that participating in a tiny house community could be a reality for more of us tiny-dwellers in the future. The next step towards tiny house sanity and peace: a tiny house studio of my own, and a shared community space. Ultimately, I can’t recommend this film enough. 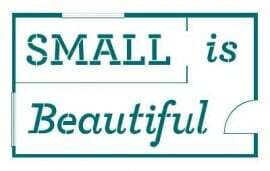 Visit the Small is Beautiful website to pre-order, or to sign up for the film’s mailing list. Enjoy! Thanks for sharing your thoughts on documentary.